An X-Wing From A Folded Subway Ticket | OhGizmo! There’s a lot of Star Wars fans out there. 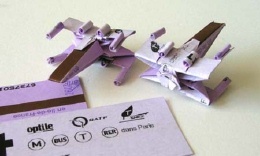 Some of them, perhaps, brave enough to contemplate spending what would take me at least a few good hours to make: an X-Wing fighter made from a cut and folded subway pass. Some dude, presumably from France, has posted a nice step by step on just how he achieved this little masterpiece. The Star Wars geek factor is the only reason this thing is on here. Story VIA Proletarium.